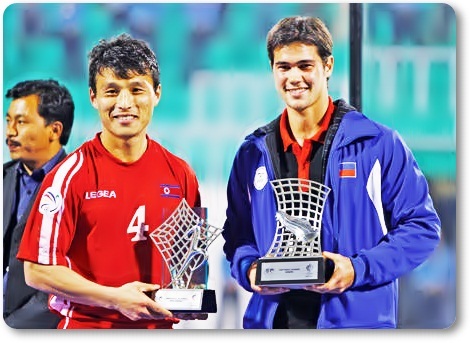 Striker Phil Younghusband cradled and kept a close eye on his most prized possession to date: The Golden Boot award in the AFC Challenge Cup. The 24-year-old Phil Younghusband was a former reserve at English Premiere League club Chelsea who now plays for Loyola Meralco in the United Football League. Younghusband finished with six goals from five matches, powering the Azkals to a historic third-place finish. Phil Younghusband said the Golden Boot award is really important to him because it is his first award at the senior level. Unlike in previous tournaments where he was isolated on the attack, Younghusband had plenty of help, and the striker believes the presence of quality players keyed his explosive performance is time. “I couldn’t have done it without my teammates,” said Younghusband, who scored twice against India and Palestine, which lost to the Azkals, 4-3, in the battle for third place, and one each against Tajikistan and Turkmenistan. Phil said bagging third place was a milestone in itself.